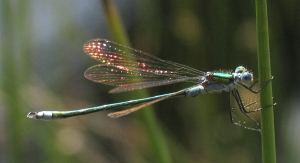 Observation - Damselfly - Emerald - UK and Ireland. Description: Mature male. First 2 abdominal segments with the bluish pruinescence. Mature male. First 2 abdominal segments with the bluish pruinescence.